I finally got tired of the pelvic and lower back pain I’ve been having while sitting and I decided to take action. I think part of my problems are due to my running and several weekends with heavier than normal weight bearing activities. I enjoy running, so, I don’t want to reduce that activity. The busy work around the house and in Scouts also isn’t likely to go away, so, I had to find a way to make my work environment more conducive to a happier body. My quest has begun! Since I found that my problems were not as pronounced while standing, it only made sense to look at getting a desk that allowed for me to stand while working. I also wanted to have the option to sit when the mood presented itself. I expected that there would be a lot of adjustable height desks available but found there actually are a lot more tall, fixed height desks than adjustable height desks. After surfing a bit more I did find several suppliers of adjustable height desks but was surprised at the lack of reasonably priced options. It seemed that the range for a descent adjustable desk starts at around $1200 and can go quite a bit higher when options are added. Before settling on a desk I stumbled on one really interesting configuration, a combination height adjustable desk and treadmill. One firm, TreadDesk, markets components that include raised floor modules such that one can make the treadmill flush with the floor, allowing you to have a chair more easily usable for times when you want sit and not use the treadmill. When using the treadmill you simply raise the desk and get on your way. While one’s first impression might be that it would be difficult to work and run at the same time, the concept is really to keep your pace slow, about 1 mph. At this pace you’d burn about 100 calories an hour and not be winded or get yourself all sweaty. Seems like a really cool option, especially when times get busy and you can’t break away for a better workout. Well, I am trying to keep my expenses down, so, the $1500 desks and the TreadDesk options aren’t going to work right now. I also wanted a desk that was full sized and not one of the many available school desk sized tables. Fortunately I came across a vendor, GeekDesk, that sells a reasonably priced desk and had the option to purchase just the frame. I think I’m on to something. The folks at GeekDesk were quite responsive and helpful to my email inquiries. Since I really wanted to keep the cost down, and also have something that still fit in with my existing modular office furniture, I opted for the standard sized frame without the desktop. This saved me both on the cost of the desk and the shipping. It also is a bit more of a green approach since I’m re-tasking my existing furniture. The frame is rated to handle 176 lbs and the warranty is two years on the motor and moving parts and five years on the steel structural frame. All told, including the wonderful 10% California sales tax (argh! ), I spent just under $700. Hard to beat. The order process with GeekDesk went smoothly. They use PayPal to manage their online orders, which works just fine. The shipping took about a week, which is what I had expected. 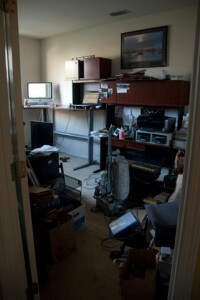 The biggest hurdle was getting up the gumption to tear apart the office to get things situated. The desk arrived while I was away on a camping trip and, upon returning, I ended up with a cold. Still, I found myself tearing apart the office a couple of days after getting back as I really wanted to get the desk in place. The packaging was quite adequate and everything looked good. The components came in two boxes with the heaviest and bulkiest box weighing in at 65 lbs. There was one small blemish on one of the floor supports but nothing worth bothering with. Some touch-up paint would be a nice-to-have. The instruction sheet was short, pretty much drawing based and appeared to be a copy of a copy of a copy, but readable and easy enough to follow, even with the metric based measurements. I deviated only in that I attached the wheels prior to assembling the frame. After unpacking the desk frame and taking a quick look at the instructions, it was time to tear apart the existing desk and shuffle things around. I have a modular office setup that pretty much takes up all the wall space in the office. In order to get what I wanted I had to disassemble two units and push another unit down the wall. 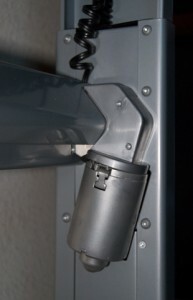 This meant removing everything from the cabinets that are on the top of the unit. 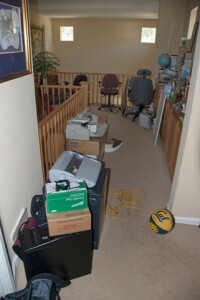 The majority of these items are still in boxes and bags and need “sorting”. To make room for tearing things apart and assembling the desk, a lot of the office items were pushed out of the office space and into the hallway, where much of it still remains as I needed to catch up on things after getting the desk together. After disassembling a couple of units I attached the desktops together using the small metal straps that had previously joined the units. I found this was totally inadequate as the desks wanted to droop where I joined the two. 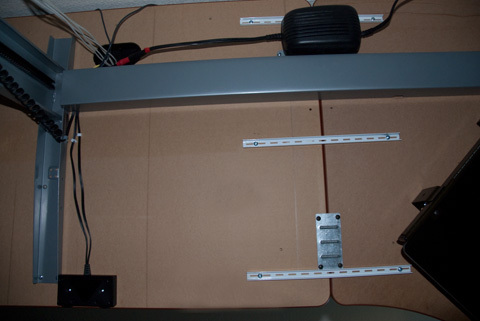 As such, I found a shelving bracket, chopped it into three pieces and used it to attach the two desktops together. This, along with the cable channel support, appears to be quite adequate at providing a level surface. I had hoped to keep at least one of the cabinet units on the smaller of the two tables. I weighed the unit and found it to be about 65 lbs. Seemed fine given that my 24″ iMac is probably 25 lbs and my laptop about 10 lbs. I figure the table top is maybe another 5o lbs. So, the total, before adding various accessories, should have been around 150 lbs. Seemed good to me given that the desk is rated to handle 176 lbs. I found though, after getting things situated, that the table was very slow to raise and would not extend to the maximum height. Very disappointing. After removing the cabinet the table still seems to raise a bit slower than the 1.1″ per second published rate but not so slow as to be a problem. Upon getting to the upper end of the height the mechanism makes a bit of a binding sound. I can’t figure out why but it does this right about where I want to stop anyway, so, I’m good with it. It was “fun” setting up the desk and moving things around in my relatively small space. Keep in mind that my office is in a sizeable bedroom but it is a complete office with all the required office and networking equipment plus furniture. It took a couple of days to get things torn apart and put back together just because I was doing some re-arranging while trying not to trip on my own feet. I am quite happy with things even though I’ve lost some storage. I think, however, that I can handle the loss as I’ll probably be able to get rid of a lot of things once I sort through them. It also forced me to pull an old printer and, likely, an old scanner out of the office. Thank the geniuses that invented the All-In-One office printers. I wasn’t wowed by my HP printers but am totally happy with my Canon MX850. More on that in another article. I’m now adjusting to standing while I work. I find it isn’t too difficult an adjustment. I do find myself shifting a bit from leg to leg and am trying to stand more evenly when I notice I’m doing this. Standing definitely is easier on my back than sitting, though, at times I still find I want to give my legs a break and sit. I’m certain I’ll find myself standing more as time passes. It’s only been a couple of days now. I also like the fact that I move around a bit more as I can easily step from laptop to Mac or to the filing cabinet…. This is both good ergonomically and from a calorie burning perspective. I’m happy enough with the desk that I purchased through GeekDesk. I do wish that the motor was more powerful as I think that’s the limiting factor on the desk not supporting the weight it is designed to support. It is a rather small looking motor. The frame seems structurally capable. Given my requirements on saving money and re-using my current furniture, I don’t believe I could have found a better solution. I give GeekDesk high marks for selling a quality desk at an extremely reasonable price point. Value for the dollar is an A+. If you have back problems or just want a more healthy working environment, then I’d suggest a sit/stand desk and feel you’d do well with the GeekDesk option. It’s a little different than the flat out desk, actually mobile. Just interested to see if you would have considered something like this if it was available at the time? Anyway, I’m working towards a sit-stand unit at home myself so you’ve inspired me. Thanks. That was a very interesting podcast. It doesn’t surprise me that one’s metabolic rate may increase by standing while one works as I find that I’m not simply being still when I stand but I’m moving about a bit. Not something I did while seated. Plus the fact the doctor mentions about the larger muscles being brought into use. I had read an article awhile back mentioning that folks that fidget tend to burn more calories, so, I’m guessing this will come into play a bit too. Another article I recently read in Time magazine noted that you may actually gain weight from exercise because folks tend to over compensate by eating more calories than they burned. While I’m still a proponent of exercise, I think the stand up desk is a way to increase one’s ability to burn some extra calories without the downside of your body fooling you into eating more. Would I have gone for the style desk you noted? Probably not as I was looking for a more traditional sized table so I could have my working materials at the same height along with a laptop and an iMac. Now, for my kids I might think about something like this as I am constantly badgering them to at least sit at a table when studying as opposed to lying on a couch and falling asleep. It does look like a well built table with the added benefit of taking up less space. 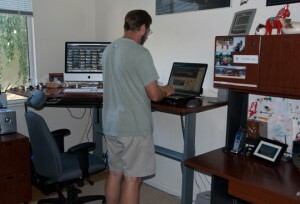 I love seeing all the bloggs regarding adjustable height desk. It seems we in America are just now figuring out the benefits from not sitting all day. The Kangaroo Desk from Ergo Desktop is a great option as well. Keep up with your great stories !! While in a lot of cases I don’t approve comments from those seeking to plug their business, in this case I don’t mind having a link to the desk you market as I would like folks to be aware of the various options and price points available for height adjustable “desks”. For me, I prefer the simple, push a couple of buttons approach to raising and lowering the desk. The pricing on your Kangaroo desk is lower, which may be good for some, but needing to add supports under the keyboard platform and turning knobs and pushing here-and-there isn’t for me. Best of luck. Hello Jeff, DId you modify the desk to fit in the corner or do they offer a corner desk? Also what about the color? Perhaps I have not done enough searching on the website…? Also I forgot to ask one more thing … did you add what looks like a keyboard/mouse pad pull out tray? I have a very similar situation so any info is helpful! Hi Lauren – I don’t believe GeekDesk has a corner unit. I actually already had a stationary desk system that takes up two walls in the office. All the desks have cabinets over the top. I decided, to both save money and keep the look uniform, that I would use the existing desktops and just add the adjustable height base to it. This also allowed me to have a corner unit. To do this took a bit of work as I had to take apart the existing unit, shuffle a couple of desks around to get a combo that would fit (corner unit and shorter desk segment), connect the two tops together to get some rigidity and then attach this to the adjustable base unit. I find that I couldn’t include any of the cabinets as the weight seemed too much for the base even though I think it was under the weight the system was designed to handle. As it is, the unit doesn’t raise as fast as they note in the literature but it is fine. I’m guessing you can do as I have done and find a relatively inexpensive corner desk that has the correct dimensions and just use the top. As for the keyboard/mouse tray, that was already attached to my desk and I left it. As you can probably see, my keyboard and trackball are on the desktop. I use the tray for a Wacom drawing tablet that I use from time-to-time. Much after the fact, I found your post. Thanks for creating it. I knew there had to be a better value out there somewhere than what I have found thus far. It’s amazing that this stuff still hasn’t become more mainstream – but it hasn’t. Still liking your desk? You may have talked me into getting one. Yes, I still like the desk. The only downside is that it doesn’t handle a ton of weight. It still will raise but slower than advertised. That said, I think it’s still the best value out there. They did a survey a few months back and I recommended they up the size of the motor. If I were going to do it again I might just go with the desktop they sell as opposed to fitting it into my existing furniture. Finally, I don’t stand nearly as much as I use to but it is nice that I can when I want to. Good luck. Thanks Jeff! this is exactly what i needed. i’ve been battling with various back/neck pains due to work and i think it is time i invest in an adjustable height desk. I’m always interested in how users get on with height adjustable desks as it’s a great help for people considering making the change to this way of working. I notice you said in an earlier comment that you don’t stand nearly as much as you used to. Is there any particular reason for that? Actually, I’m back to standing more now. Most days I start standing at my desk. I do this until the early afternoon. I don’t recall why I had stopped standing as much but I did have a period of time where I was having some running overuse issues with my hip. So, it could have been I was more comfortable sitting at the time or it could just be one of those cyclical things for me. 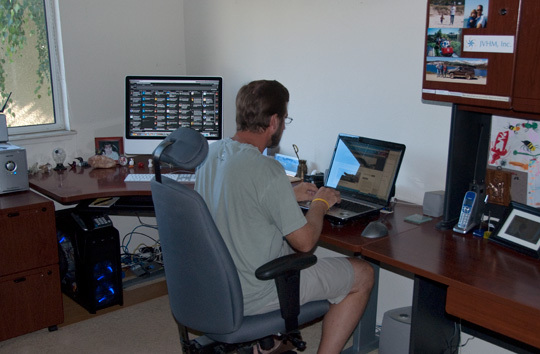 I still am quite glad I have a height adjustable desk and can’t see going back to a fixed height desk. In fact, the parts of my office system that I dismantled but saved, are now in the pile of items in the garage waiting to be carted off. Thanks for the update Jeff and good to see you’re back to standing regularly. Hello Jeff. If you tire of standing (but want the benefit of ideal spinal posture achieved while standing) consider “saddle seating”. To achieve ideal spinal posture while sitting the legs (thighs) need to be at least 30 degrees off of the horizontal (as seen in horseback riding). This creates the ideal spinal curve necessary for people dealing with back and neck pain, but takes a load off of your feet. This type of seating works ideal with an adjustable height desk as the seat is typically going to be 8″ of more higher than traditional seating to allow your thighs to drop 30 degrees off of the horizontal. Thanks for the tip Brian. I’ll have to check into that. Just wanted to know how your desk is holding up? Any problems with the motor. I am thinking about purchasing geekdesk v3 but the motor is the one thing I worry about. Any idea how much the cost of repair would be once they fail after the warranty. It’s hanging in there. Sometimes a bit slow raising but hasn’t stopped as yet. Don’t know what it would cost to replace the motor but would hope not too much. Guess you could ask them. Good luck.